First Friday: Oceanside Art Walk started in 2013 as the first major effort of the newly formed Oceanside Cultural Consortium, spearheaded by Daniel Foster (formerly of Oceanside Museum of Art) and designed & developed by Dinah Poellnitz (The Hill Street Country Club), with assistance from the formation team of Brigid Parsons (LocalArtWalk.com), Cynthia Melfi (El Camino Country Club), Mitzi Summers (Oceanside Museum of Art) and Gumaro Escarcega (MainStreet Oceanside). Brigid Parsons was its general manager and administrator 2014-2016. The first event was held on August 1, 2014 with 18 venues, about 40 artists and thousands of local residents enjoying the night. By the end of 2016, over 300 different artists appeared in 28 monthly events, showcased by over 40 different venues in downtown Oceanside. Venues chose to either engage their own artists (self curate) or requested visual and/or performance artists from the Art Walk curation team. Oceanside is the home to military, surf, skate and NOW A THRIVING ART DISTRICT. Join us as we promote our vibrant art community showcasing live performances, music, poetry, art education, culinary and pop-up art galleries embedded in local businesses and public spaces. Why : The Oceanside Cultural Consortium (OCC) was established in 2013 with the goal of establishing Oceanside and surrounding communities as an important arts, culture, entertainment and tourism hub/destination that catalyzes economic prosperity and a high quality of life for Oceanside’s future. Its members included nearly 50 different Oceanside arts, community, business, and civic organizations. 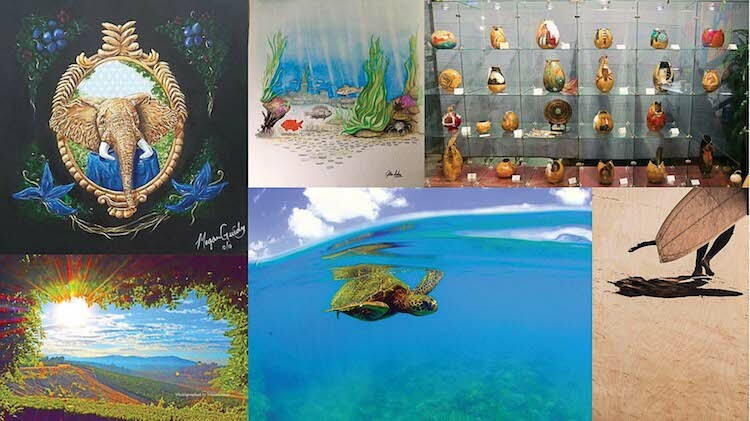 In 2015 First Friday: Oceanside Art Walk became a stand-alone nonprofit, and starting in 2017 the events will be presented by Oceanside Friends of the Arts. How Much : Free to Attend! Event maps distributed at each event, listing that month’s locations, art happenings and sponsors. The first few events in 2014 were curated by Dinah Poellnitz (The Hill Street Country Club), December 2014 by Brigid Parsons (LocalArtWalk.com), February 2015 by Penny Hill (San Diego Watercolor Society), and the rest of 2015 by Gailee Walker Wells (Theatre Arts West). Cynthia Melfi (El Camino Country Club) was the curator for 2016, with Brigid Parsons leading the literary art walk in July 2016. In October 2015, First Friday: Oceanside Art Walk became a 501(c)(3) non profit corporation, Tax ID #47-5148895. On January 1, 2017 the non profit was disbanded. 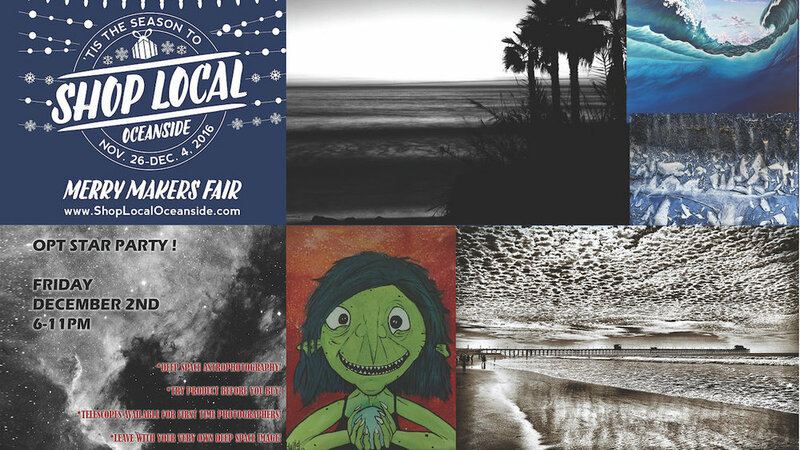 Below are the venues and many of the artists that participated in First Friday: Oceanside Art Walk for December 2016. 217 N Coast Hwy (760) 433-8900 Artist retrospective including 11 artists with works ranging from watercolor to stone, realism to abstraction. Foodies by Sonia - It's a fun sweet night, with cupcakes, cake pops, rum balls and more! 219 N Coast Hwy Painting for Peace - participate in painting murals that will be given to local groups by American Embassies in countries struck by tragedy over the past few weeks, From Oceanside with Love: mural for Russia, led by Ed Coonce, in association with Art Miles Mural Project! Other murals for Paris, led by Beatriz Hidalgo, and Beirut, led by Lina Abi-Samra, will be painted at the Muramid International Mural Museum and Art Center in Artist Alley. 212-F Artist Alley formerly LIVE Store Painting for Peace - participate in painting murals that will be given to local groups by American Embassies in countries struck by tragedy over the past few weeks, From Oceanside with Love : murals for Paris, led by Beatriz Hidalgo, and Beirut, led by Lina Abi-Samra, in association with Art Miles Mural Project! Additional mural for Russia, led by Ed Coonce, will be painted at Studio 219 at 219 N Coast Hwy. Keep Calm Relax & Color - unwind and color! 212-F Artist Alley formerly LIVE Store explore the *NEW* Mural Museum in association with Art Miles Mural Project! participate in The Big Draw! See and experience the magic of tintypes: Rizzhel Mae Javier and Alejandro Arreguin Villegas bring the wet plate process and field darkrooms! Bob Radio and FM94/9 San Diego posted up at the shop until 8pm giving away concert tickets!